This is the latest vacuum separator with 3 in 1 multifunction, it's a preheater, a LCD frame separator, as well as an LCD touch glass separator. With this you do not need to buy separate machines as all are built in. This model can do all models which are listed below. 1. 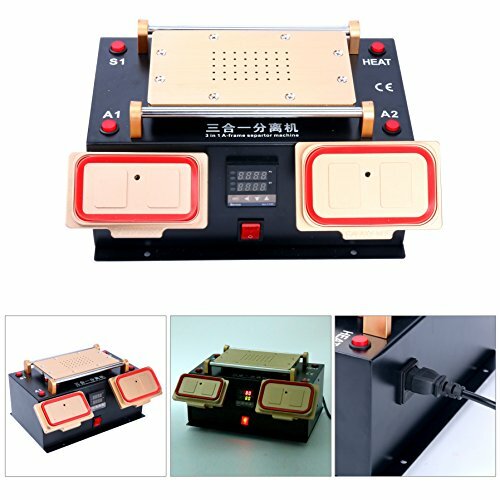 This LCD Separator machine is specialized in separating Mid frame from Assembly universal for Samsung S1 2 3 4 5 6, Note 1 2 3 4 5. 2. Built-in 2 mini vacuum pumps: Do not need any clamps, also with the same principle in vacuum working, even on the inclined plane, LCDs can be suction tightly. 3. With 2 operating panels: The model in the left is for LCD separating for Samsung S1 S2 S3 S4 S5 S6, the right one is for Samsung Note 1 Note 2 Note 3 Note 4 Note 5, this means that you can separate 2 different LCDs at the same time . 4. Easy to operate, plug and play: You do not need to adjust any settings, just plug the power, press the bottons, the machine can do all for you. LCD screen separator for smart mobile phone which LCD screen's size is 7 inch and below. LCD frame separator for Samsung Galaxy S1 2 3 4 5 and Note 1 2 3 4 5. This LCD Separator machine is specialized in separating Mid frame from Assembly universal for Samsung S1 2 3 4 5 6, Note 1 2 3 4 5. Built-in 2 mini vacuum pumps: Do not need any clamps, also with the same principle in vacuum working, even on the inclined plane, LCDs can be suction tightly. With 2 operating panels: The model in the left is for LCD separating for Samsung S1 S2 S3 S4 S5 S6, the right one is for Samsung Note 1 Note 2 Note 3 Note 4 Note 5, this means that you can separate 2 different LCDs at the same time . Easy to operate, plug and play: You do not need to adjust any settings, just plug the power, press the bottons, the machine can do all for you.